We've had a report that two were killed in a mobile home that was rolled by a tornado earlier this afternoon. There was significant damage, extent not fully known, in the south and west parts of Alexandria, Louisiana. Several other small tornado strikes have been reported. 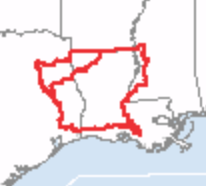 The areas enclosed in red are currently under tornado watches. I no longer "live blog" storms. I do, however, provide severe weather updates -- when possible -- @usweatherexpert on twitter.